The formula is simple: Egg + Vegetable + Meat = Delicious. Apply that to a frittata and you have a winning breakfast! The key to this dish is to skin the poblano peppers to best wield their smoky, complex flavors. 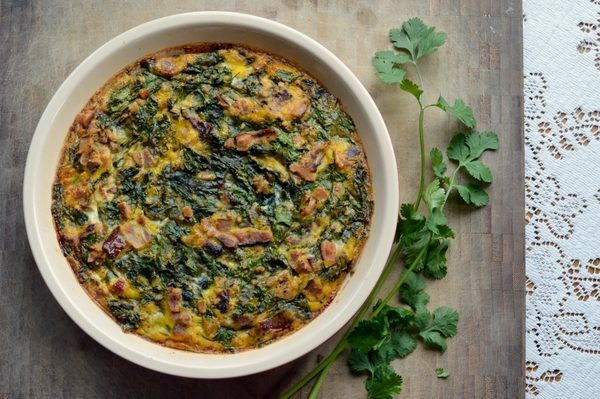 The great thing about this frittata is that it works well as a family meal or as a portable breakfast for those of us on the go. It re-heats well too! We know you’ll love these green eggs and ham! Drizzle your poblano pepper with olive oil and roast on a baking sheet for 7 minutes. Flip the pepper over and roast for another 7 minutes until the outer skin begins to flake. Transfer the roasted peppers to a large mixing bowl and cover with plastic wrap. This will allow the pepper to steam itself, making skin removal easier. Let sit for 15 minutes or so. Remove the stem, seeds, and outer skin from your poblano pepper and chop into large pieces, about 1/2-inch thick. Reduce oven temperature to 280° F.
Fry your bacon in a large pan at medium heat for 5 minutes. Crack your eggs into a large mixing bowl and whisk for 2 minutes, adding salt and pepper to taste. Transfer bacon to a paper towel using a pair of tongs, saving about 1 tablespoon of bacon grease. Leave the frying pan on the stove. Once bacon has cooled, chop into 1 1/2 inch pieces. Add leeks and kale to the bacon grease in the frying pan. Cook for 4 minutes on medium heat until the vegetables become soft. Grease a 12-inch pie plate. Add kale, leek, cilantro, and 3/4 of your bacon to the pie dish. Add your whisked eggs on top of them. Add your remaining bacon on top of the eggs. Place your pan in the oven and bake for 35 minutes, until the frittata is cooked through all the way. Let cool before serving.